Arreola, A.; Fortuny-Santos, J.; Vintro, C.
The most common solution strategy for stochastic supply-chain man-agement problems that are analytically intractable is simulation. But, how can we be sure that the optimal solution obtained by simulation is in fact the true optimal solution? In this paper we try to shed light on this question. We report the results of an extensive simulation study of a base-stock controlled production-inventory system. We tried different values of base-stock levels (R) to determine, via simulation, which was the value that minimized the total inventory holding and backordering costs per period. For 25 different cases (and 100 replications each), we compared the optimal solution obtained from simulation (Rs*) with the true optimal base-stock level (Ra*) obtained from an analytical result, with the goal of obtaining a lowerbound of 95% matches. Results show that when the traffic in-tensity increases, the run length necessary to achieve a minimum of 95% matches increases too, and when the backorder cost increases, the number of matches de-creases for each specific run length. In most of the cases simulated, 100,000 de-mands were enough to achieve reasonably reliable results. The most common solution strategy for stochastic supply-chain management problems that are analytically intractable is simulation. But, how can we be sure that the optimal solution obtained by simulation is in fact the true optimal solution? In this paper we try to shed light on this question. We report the results of an extensive simulation study of a base-stock controlled production-inventory system. We tried different values of base-stock levels (R) to determine, via simulation, which was the value that minimized the total inventory holding and backordering costs per period. For 25 different cases (and 100 replications each), we compared the optimal solution obtained from simulation (Rs*) with the true optimal base-stock level (Ra*) obtained from an analytical result, with the goal of obtaining a lower bound of 95% matches. Results show that when the traffic intensity increases, the run length necessary to achieve a minimum of 95% matches increases too, and when the backorder cost increases, the number of matches de-creases for each specific run length. In most of the cases simulated, 100,000 demands were enough to achieve reasonably reliable results. 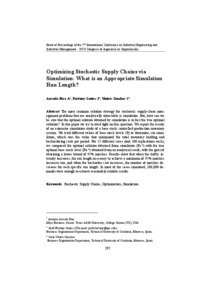 Arreola, A.; Fortuny, J.; Vintro, C. Optimizing Stochastic Supply Chains via Simulation: What is an Appropriate Simulation Run Length. A: Industrial Engineering and Complexity Management. "7th International Conference on Industrial Engineering and Industrial Management. XVII Congreso de Ingeniería de Organización (CIO)". Valladolid: 2013, p. 297-305.